OK, it may work now, you can reboot without the stick. And if it doesn’t still work, can you get the BIOS see the boot options as before? it works! thank you a lot ! But I just noticed one issue with the grub-install command you just did. There was one too many efi word… sorry about that (shouldn’t work so late…). This command should fix the Windows in the grub (famous last words… ;)). It should give a new boot GRUB entry “Windows”, and selecting that should boot to Windows. i have an other question how can i add memtest to the efi boot options like we did to antergos ? @manuel and do you know why i have 2 EFI folders? one with only antergos and the other with the EFI options that i had before setting the bios to default ? Could we load the bios menu with tje forst EFI folder that contains all my previous bios entry? I think you can safely delete E:\EFI\EFI folder. 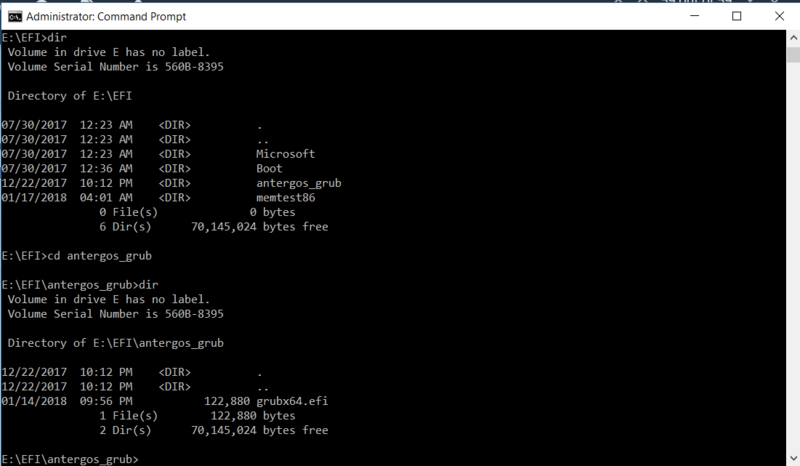 You could still check that folders E:\EFI\antergos_grub and E:\EFI\EFI\antergos_grub have about the same files. It was created in the first attempt of grub-install command, the line had option --efi-directory=/boot/efi/EFI. The second grub-install attempt put grub’s efi info into the right place (into /boot/efi). in your existing Antergos install. I was too tired yesterday to notice you still need to do that to have Windows in Antergos’s boot menu. EDIT: Seems that memtest is not enabled by default, and TBH I’ve never used it in Antergos. There is a memtest86+ package in official repos, and memtest86-efi in AUR packages. Maybe one of them would work (although please note that AUR packages are not officially supported and are made by any user that wants to offer a package). Thank you manuel , you saved me! Thanks and great to hear it works now! @manuel unfortunately, i started windows 10 then i shutdown my pc. After 2 hours i wanted to log in with antergos but suddenly my pc boots automatically to windows. 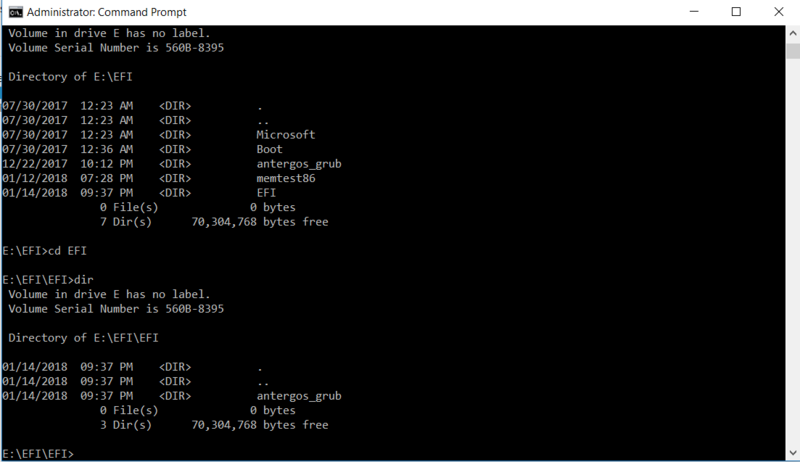 I entered to the bios menu to change the order but i didn"t found the antergos_grub and memtest86 again :( . I have only windows boot manager, do i have to mount it everytime i start windows 10 ? Hmm… What is your machine’s exact model? It is a known fact that e.g. some HP machines tend to boot only to Windows unless some trick is used to work around that. It may be that Windows or Lenovo somehow deletes external boot files (mainly *.efi files) from the EFI partition, that would explain why Antergos boot stuff disappears after a reboot or shutdown. Can you check what files there currently are under E:\EFI, and are they now different from the time when Antergos was working OK?